The bank holiday weekend proved memorable not just for the warm weather but also for notable race wins by no fewer than three Run-Fast athletes. First to cross the line was Pete Huck who won the Lillebaelt Half Marathon in Denmark on Saturday afternoon. 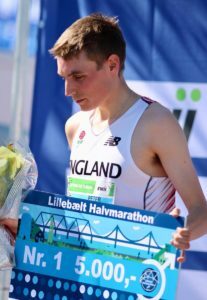 Pete was selected to run for England in this event following a string of good cross-country performances earlier this year. In warm conditions, he finished in 67:27, well over a minute clear of his rivals. On Sunday evening, Jonny Hopkins was crowned Welsh 5k champion at the Cardiff 5k in the city’s northern suburbs. He won in 14:18, almost twenty seconds ahead of Ieuan Thomas. Jonny is maintaining the good form that saw him represent Wales at the Commonwealth Games (3000m steeplechase) last month. At the BUCS Outdoor Championships the following morning, one of our youngest athletes Emile Cairess enjoyed one of his most impressive victories to date, winning the 5000m in 14:00.30. Running for St Mary’s University, Emile prevailed against a number of high calibre opponents including Jonny Davies, Alex Teuten and Mahamed Mahamed. Elsewhere over the weekend, Joseph Aperumoi finished 2nd in the Geneva Marathon and Dan Studley was 4th in the 5000m at the Irish Milers Meet at Greystones in County Wicklow.